There were some exciting wildlife sightings in Glen Providence Park this January, with this lovely Red Fox, and a Great Horned Owl being pestered by American Crows! 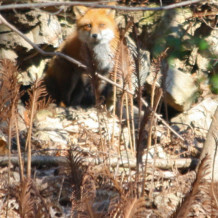 In both instances, by keeping my distance, I was able to observe them for several minutes. There were some bitterly cold days, but the wildlife is amazingly well adapted: on a hike in 14 degree weather, the birds were active and downright noisy around the pond! It was also mighty cold the day of our Winter Tree Walk– but we had an amazing time nonetheless! Our fingers were too cold to capture the Great Blue Heron perched nearby. 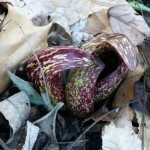 But on that hike we discovered that the Skunk Cabbage in the wetlands along Broomall’s Run was up remarkably early, which shows how mild this winter has been overall. 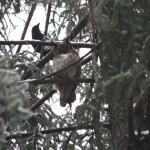 It is appropriate that many of our sightings were birds: as we started our Birding Big Year on January 1! 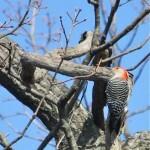 We are up to 74 total bird species documented in Glen Providence Park (35 this year), and counting… The Red-bellied Woodpecker may be the bird species I most consistently see (and hear) in the park. To learn its calls, click here. 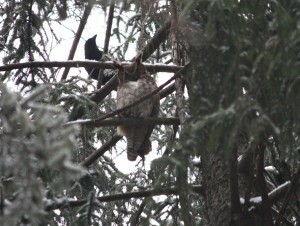 After our only real snowfall so far this winter, I spotted the Great Horned Owl. 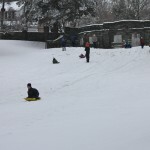 It is understandable (and brave!) 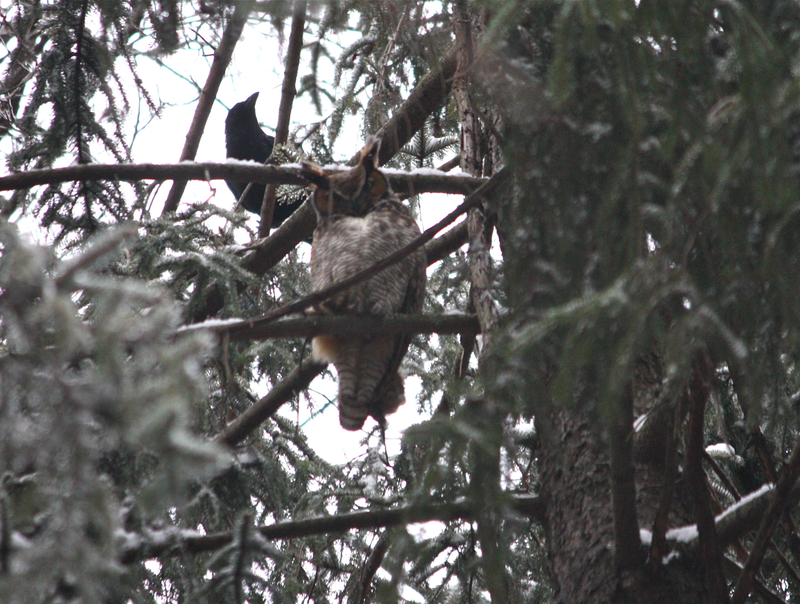 that crows pester the owl, as Great Horned Owls are known to prey on crows, and in fact we have found the feathers of an unfortunate crow along a trail in the park. 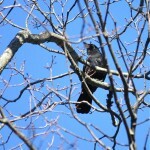 It is common to see crows “mobbing” hawks in the park. 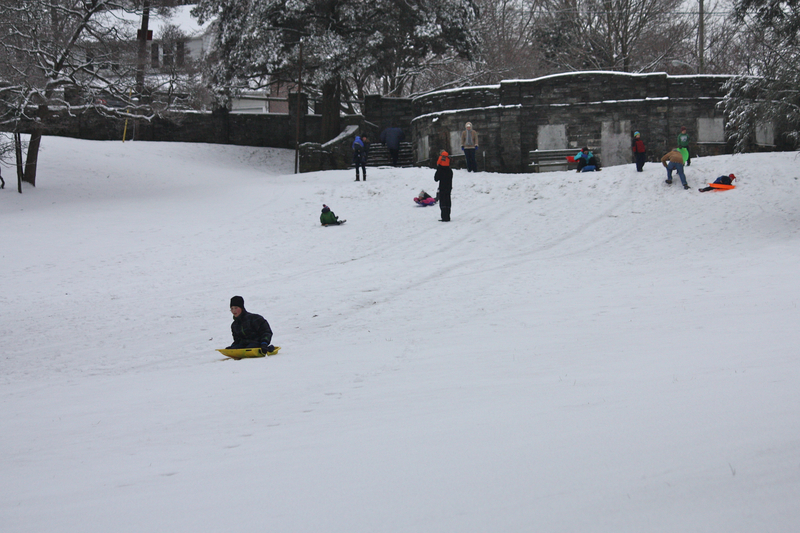 It’s a good thing that people enjoyed the snow on the sledding hill while they could, because it didn’t last long! 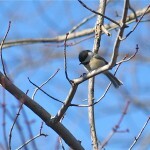 By the end of the month, the weather was so warm that Spring seemed imminent. And alas, we found our first tick of the season (in January!). 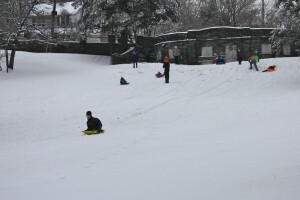 Here’s hoping for more snow this winter… we have sledding and cross-country skiing in the park to do! Click on any photo for a closer look, or scroll through the photos below. 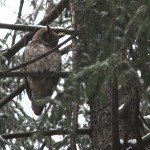 You can view more photos in our Facebook Albums: including Wildlife, Scenery, and History. 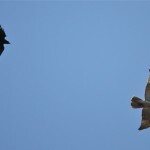 American Crow chasing a Red-tailed Hawk – you’ll need to click on this one to see them!